Are You Brave Enough to Enter the Pyramid of Horus? 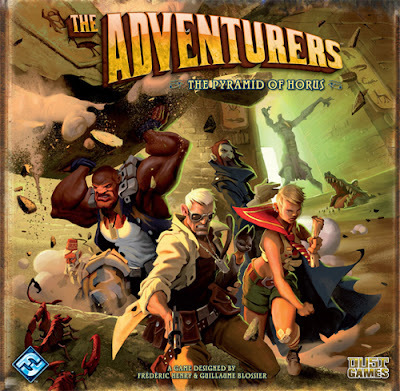 The Adventurers is a quick-playing game of hunting for treasures inside a crumbling pyramid. Each player assumes the role of one of eight Adventurers each with their own special ability. On each turn the Adventurers will work their way through four sections of the pyramid. Each section has its own set of tools, treasures and wound inflicting creatures. Useful tools can be found the entrance. Unfortunately, so can cobras. The next two sections hold many treasures along with either scorpions or crocodiles. The fourth section contains even more valuable treasures, but is guarded by wandering mummies. Just in case that doesn’t sound dangerous enough, the pyramid is crumbling. A stone block falls on the escape route after each adventurer’s turn. Getting hit by a falling block inflicts another wound. All an Adventurer has do to win the game is explore the various pyramid sections, grab as much treasure as possible and escape from the pyramid before the falling blocks completely seal off the exit. Just one more thing, the more stuff you carry and the wounds you take the slower your Adventurer moves. Be careful, an Adventurer can only win if they escape. Any Adventurer trapped in the pyramid loses. So, are you brave enough to enter the Pyramid of Horus? We have an open copy of The Adventurers: The Pyramid of Horus available in our Store Demo Library for you come in and try out.